Use this detailed sales pipeline template to manage your sales funnel process. 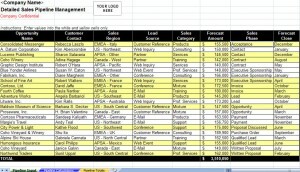 This detailed sales funnel pipeline spreadsheet includes 3 spreadsheet to help management this sales pipeline process. The Microsoft template can be downloaded instantly for free on this page. Get yours today! The Pipeline Input spreadsheet gives a detailed overview of your sales pipeline funnel process. It includes the different pipeline phases of your sales funnel process – acceptance, contact, executive sponsorship, invoice, lead, opportunity, proposal payment, purchase order, qualified lead, and written proposal. The Pipeline totals gives you a sales pipeline chart of the sales funnel process. I like your pipeline spreadsheet, however, it assumes that a sale is a one-time event. Do you have a spreadsheet that forecasts on-going quarterly sales? Please advise. Thank you.